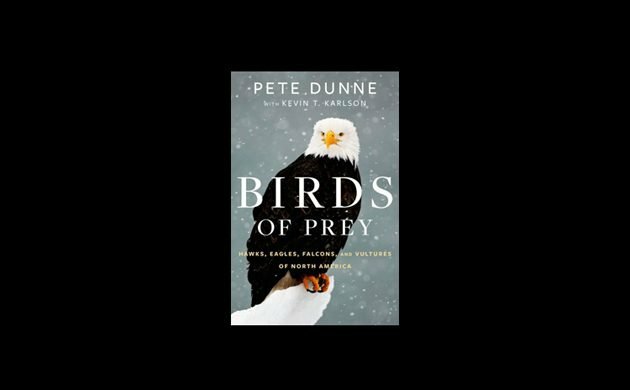 Most birders are enamored both of raptors and Pete Dunne, which is why Birds of Prey: Hawks, Eagles, Falcons, and Vultures of North America is a book any birder would love (Carrie certainly did.) No wonder we had such an excellent response to our triple-tiered Birds of Prey giveaway. The second and slightly more challenging way to win was to share news of the giveaway on Facebook while using the hashtag #birdsofprey. Kudos to Zach S. in Albany, New York. Zach sometimes leads trips for the Hudson-Mohawk Bird Club and also writes about labor and universities. I am a humble, sweet-natured beginning birder, with a dark secret. I have the privilege of living in a ponderosa stand in the front range of the Rocky Mountains of Colorado, the most beautiful state in the union. Every year I put up at least 4 bird feeders – safflower seeds, black oil sunflower seed, suet and a hummingbird feeder. I get about 4 types of birds: nuthatches, juncos, broad-tailed hummers and the occasional and much ballyhooed western bluebirds. But the feeders are not an altruistic exercise in watching tiny, plump, cute little birds hop around my yard. My secret – and I’ll never tell the kids – my very secret desire is attracting the Coopers Hawks. When they start nesting, and they always do, in my neighbor’s pines I’ll take the feeders down; I’m not a monster, although I do tend to leave it until the hawks are fully situated. Watching the cool, red-eyed, calculating killing machine perch so silently and swoop so effortlessly between the trees – this is the reason that I lure my unsuspecting sacrifices to the feeders – like a house made out of candy in the middle of the woods. Coopers hawks are the reason I started seriously birding in the first place, their nest next door lead to the purchase of my first pair of “real” binoculars, which of course lead to the weekly excursions and the eventual near-obsession. When the hawks leave for warmer lands in the fall, the feeders go back up and I can start to convince myself that I am the amiable birder that I believe myself to be. Congratulations to all of our winners and to all of you who still haven’t had the pleasure of reading Birds of Prey: Hawks, Eagles, Falcons, and Vultures of North America. Thanks to everyone who participated. Stay tuned for our next big book giveaway! ….and I was so close!! Congrats to all the winnners, now I have to go order mine. Thank you so much! It was such a surprise to me as I just recently found this site and subscribed. I’m looking forward to receiving it and reading it. 🙂 Blessings to you! Congrats to the winners, you’re in for a treat! Hey there! Have I mentioned that I received my book (THANK YOU AGAIN!) and have read it, re-read it, dog eared a page or two (I am that kind of person, my books are well loved), left it in the rain when I went out tracking hummingbirds, spilled some coffee on the cover, and then read it again. Great book, great pictures.